Marco Livadiotti has lived in Yemen for most of his life. Here, he tells the story of the country's architectural wonders – and what needs to be done to save heritage across the entire Arab world. In 1961, as a five-year-old child, I would accompany my father to Saada. This ageless city of beautiful multiple-stories high mud-houses built in the traditional zabur style had been the capital of North Yemen for many centuries. My father, an Italian, had been appointed the personal doctor of its ruler, Imam Ahmed. 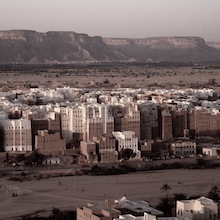 More than 40 years later, in 2002, Saada’s unique architectural value started being recognized, when the city became an official candidate for the UNESCO World Heritage list. Yet in 2006, civil war in the province triggered the beginning of its decline, as it was bombed by Yemeni government forces trying to quell a rebellion there. In 2015, it was no longer in decline, but inexistent: the bombing campaign of the Saudi Arabia led coalition, trying to reverse the Houthi rebels’ takeover of the country, had all but flattened it, almost to the very last standing structure. Yemen is a little known jewel, boasting a rich cultural and historical heritage which is unsurpassed in the Arabian Peninsula. The legendary Queen of Sheba hailed from the lands of Yemen, and the pre-Islamic temples of Marib are a possible testament to her existence. The remnants of the nearby dam, built in the 8th Century BC and which according to Quranic tradition famously burst seven centuries later, can still be visited today. Shibam, referred to as the “Manhattan of the Desert” due to its high-rise mud-brick buildings of up to 11 floors, is an architectural wonder. And of course the old-city of Sana’a, which has been continuously inhabited for the past 3,000 years and to which references are made in the Bible, offers a unique architecture composed of century-old ginger-bread-like houses adorned with mosaic windows and green gardens that give any visitor the impression of walking in a fairy-tale. As war continues to spread across a vast part of Yemen, and as its dramatic human and infrastructure toll continues unabated, the old city of Sana’a is at a significant risk of being lost for humanity. Direct aerial bombardments and vibrations resulting from bombardments in its perimeter are resulting in almost irreparable structural damage, adding to the damage occurring at times of peace when construction violations are gradually eroding the heritage and magic of the city. The global community has already proven that collective and sustained action can achieve miracles. In 1979, renowned Italian film-director Pasolini was the first to issue an appeal to save the old city of Sana’a. His efforts, and the ones of numerous personalities from various countries contributed to Sana’a being placed on the UNESCO World Heritage list in 1986. In the early 1990s, I recall hosting in Sana’a, the Director of Palazzi Grassi, the writer Alberto Moravia, the chairman of Real Madrid, the Princess Isabel Do Borbone, the Minister of Culture and Tourism of Yemen, together with a delegation of the Ministry of Culture of France which included architects and journalists. Ideas, studies and project proposals were giving new life and spirit to the Old City. People from all over the world were calling to give ideas, wanting to come and visit. In Europe, it was suddenly chic to be talking of Yemen and Sana‘a. Such efforts should not be abandoned. As the Middle East continues to burn, and as historical sites continue to be destroyed in Iraq, Syria, Yemen and beyond, through either the folly of fundamentalists or through the folly of war, a new impetus is required to preserve and protect the region’s cultural heritage and its stunning diversity for humanity. As the UN General Assembly adopted a resolution against the destruction of cultural heritage in Iraq a couple of days ago, I call on our collective conscience and responsibility, from individuals to governments for using everything in our means to preserve the Arab heritage for the world. Future generations deserve the right to appreciate and cherish the positive contributions of humanity, rather than be left to wonder as to how they could have been allowed to disappear. Nicolas Dunais contributed to this article. He is a telecommunications consultant based in the Middle East and lived in Yemen in 2005 and 2006.